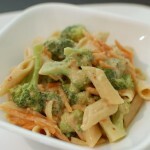 Easy Vegan Recipes – Szechuan Recipes – Peanut Butter Pasta Recipe | Cook Eat Delicious! A Pasta that can be served at room temperature is known as a Pasta Salad. They are great for picnics or barbecues. If you are a working mom, pasta salads are great to make ahead of a busy day and serve for dinner. I made this on a very hot day and it worked out great to eat out on the patio. 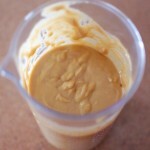 If you like peanut butter then this recipe is definitely for you. The heat is kicked up with red pepper flakes so if that isn’t for you, please omit! What is great is that this can be served for all your vegetarian or vegan friends and it is delicious even for carnivores. 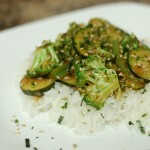 Yay for Vegetarian & Vegan Recipes! This recipe comes from “The Good Housekeeping Step-by-Step Cookbook.” My Dad gave me this cookbook after I got married. It has become my favorite of the few cookbooks that I own. Every recipe that I want to cook has been dog-eared or bookmarked with a post-it. Others that I have cooked have notes and food stains all over! 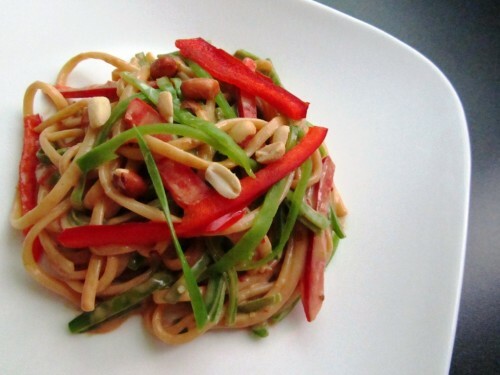 So this Szechuan Peanut Pasta is one of my “Bookmarked Recipes” and perfect for the challenge of the same name hosted by Jacqueline from Tinned Tomatoes and Ruth’s Kitchen Experiments is the Challenge founder! It is also going to be sent into Anamika at the “Taste Junction” for her event “Drive Me Nuts”! 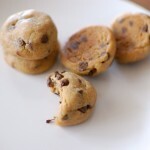 This is my 3rd & 4th food blog event! Yay! Delicious Rating: A very simple and easy dinner this is. You can use leftover pasta as well to use it up. The sauce is delicious! It is creamy, spicy, and salty all together. Don’t overcook the snow peas. The crunch gives such great texture to the pasta and sauce. As it sits the sauce does get a bit too creamy. If this happens to you add 1/4 cup of pasta water or any hot water and stir. The sauce will loosen up and it will be easy to serve. I really liked this pasta salad. 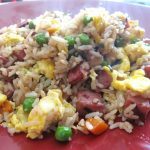 I plan on making this easy recipe again in the future. Prepare pasta as package directs. Reserve 1 cup of cooking water, rinse pasta in cold water and drain. 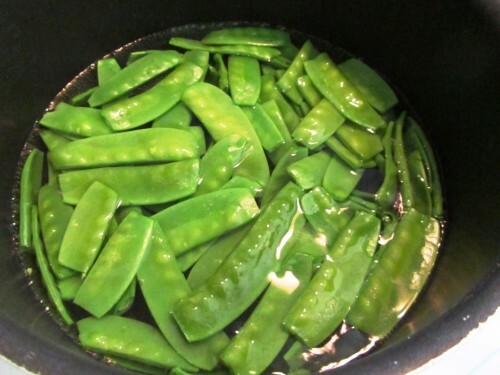 Heat 1-inch water in saucepan to boiling, add snow peas and simmer for 1-2 minutes. 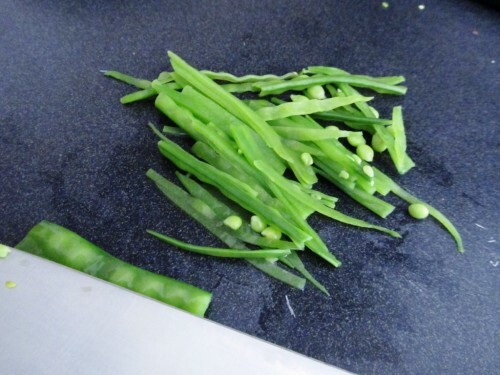 Rinse peas in cold water and cut into thin strips. 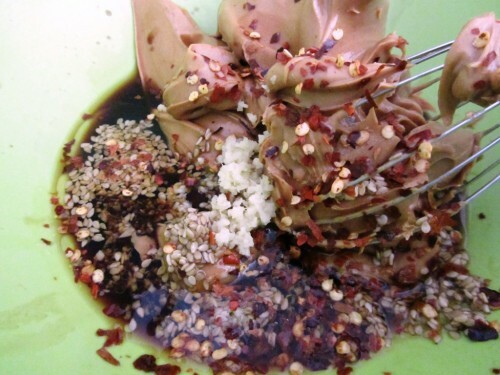 In a large bowl whisk peanut butter, soy sauce, vegetable oil, sesame oil, vinegar, ginger, and pasta cooking water until smooth. 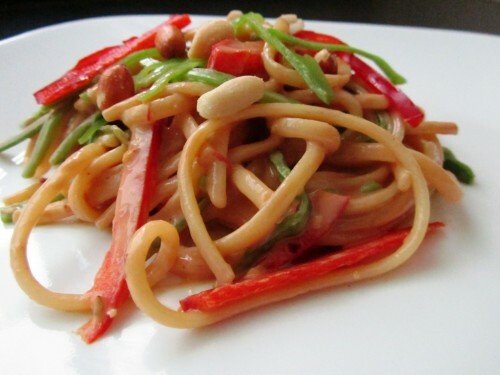 Add pasta, snow peas, and bell pepper strips to peanut butter sauce and coat all well. Don't overcook the snow peas. The crunch gives such great texture to the pasta and sauce. As it sits the sauce does get a bit too creamy. If this happens to you add ¼ cup of pasta water or any hot water and stir. The sauce will loosen up and it will be easy to serve. Be sure not to over cook the snow peas so that they aren’t mush but still have a nice crisp. You may be thinking, “How in the heck is this going to be good?” But the combination of peanut butter with Asian flavorings are perfect together. The ginger is real deal breaker here, use fresh if you can find it. Thanks for your entry dear!! Got to give your recipe a try sometime.. Please do & let me know what you think of it! This sounds like an interesting way to have spaghetti.. 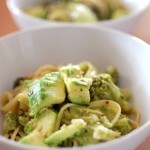 It is a delicious way to use up leftover spaghetti noodles, that is why I love this recipe! That looks so tasty Raven and I love the step-by-step photos. I am just writing up the roundup now. A great addition. Thanks Jacqueline! I am no chef like you though!